The first film magazines in Taiwan were published during the 1940s, with at least five publications in circulation at the time. Due to the sombre political climate and strict publishing controls, these short-lived film magazines had only a limited sphere of influence. In the 1950s, film companies started to publish their own publicity materials. These included publications such as International Film Education (?????? ), by the Motion Picture & General Investment studio (MP&GI), and the celebrity-oriented Social Studies and Motion Pictures Weekly (??????). Among these magazines, there was also Cinema Journal (???? )(1958-1966), a publication singled out by respected film critic Huang Ren for its scholarship. It folded after just six issues. However, the two most important publications that contributed to cinematic discourse in Taiwan were Theatre (??) and Influence (??). From its debut on 1 January 1965 to its last issue on 15 January 1968, Theatre published a total of nine issues. Priding itself as a magazine that introduced and analyzed avant-garde cinema and theatre, its sections on cinema were generally better received, and continued to inspire readers years later. In one of these sections, the magazine frequently translated the screenplays of what were then considered “avant-garde” films. These included Hiroshima Mon Amour (1959) and Last Year at Marienbad (1961) by Alain Resnais, La Dolce Vita (Federico Fellini, 1960) and La Notte (Michelangelo Antonioni, 1960). Although these films are now regarded as cinematic classics, they were seldom screened in Taipei at the time. Eager cinephiles who had no access to these films could only imagine them in their heads with the help of these translated screenplays. This created a strangely ironic phenomenon where Taiwanese cinephiles would be thoroughly familiar with films that they have never seen before. The equally legendary film magazine, Influence, had a more complicated history. Its first incarnation debuted on 10 December 1971, and, after 15 issues, ceased publication in March 1977. It resumed in December 1977 for another nine issues, but eventually folded, once again, in September 1979. A decade later, a newly revamped version of the magazine was launched on 20 November 1989. Although the new team intended to continue in the tradition of the first two incarnations, the new version of Influence bore little similarities to its previous versions. Like Theatre, the 70s versions of Influence were also niche publications, and continued in the tradition of introducing films by renowned foreign directors. However, Influence was far more influential on the film community. On top of its serious appraisal of Hong Kong and Taiwanese cinema, it was also known for its sharp criticism of current film culture. It had the foresight of recognizing the talent of Sung Tsun-shou (Song Cunshou), a filmmaker who was largely neglected at the time. In addition, it was also notorious for its list of Ten Worst Films, which was relentless in criticizing filmmakers who attempted to use their power to dominate the film industry. This created a huge controversy which put Influence under constant pressure from every field. On the other hand, it also gave Influence the reputation of being a cultural champion. Neither Theatre nor Influence were widely circulated at the time. Largely ignored by the media, they did not enjoy a wide readership. They were only hailed by cinephiles much later because of their defiantly objective stance in the face of mass propaganda. It was tough supporting these publications in those days, not because readers would get into trouble if they did (Taiwan wasn’t that repressive, and people didn’t treat these magazines seriously anyway), but because it was difficult to see the films that the writers were championing. Information on these movies were few and far between, and not many films even screened in theatres at the time. This is what sets apart the 90s version of Influence (or, as it is now called, The New Influence, ???). By the late 80s, MTV lounges started to proliferate in Taiwan. In this uniquely Taiwanese version of the Japanese karaoke lounge, one could select and watch any amount of VHS tapes or Laser Discs for just NT$100. It even came with a free drink. This fad lasted all the way til the early 90s, right until American copyright law decimated the industry. Incredibly, one could find in an MTV lounge old classics, arthouse movies, and even little-known ethnic films that had yet to find their way into film textbooks. It had even more films than a proper film library. From its inception, The New Influence had had a close working relationship with the then-famous “Sun MTV Lounge” chain, since they were both owned by the same person. Under the leadership of critic-turned-filmmaker Chen Kuo-fu, the magazine dedicated twenty to thirty pages of every issue to relatively unknown auteurs such as Pedro Almodovar, Peter Greenaway, and Andrei Tarkovsky. In conjunction with this, it also provided a VHS mail order service for the films of the different auteurs it profiled. Since none of these auteurs were ever screened in Taiwanese cinemas, this was the only film education available to ardent cinephiles. These cinephiles didn’t mind that the sale of these VHS tapes bordered on piracy; for collectors who were already willing to pay for these films, this service was seen more as a charity than as a business. Alas, this couldn’t last long. With the “Special 301 Report” came the international enforcement of copyright under U.S. trade law. This marked the demise of the MTV lounges that had long operated on the fringes of legality. The New Influence had always depended on these lounges for its funding; it was more expensive to produce than most magazines due to its extensive and in-depth writing, and its sales were just not high enough to sustain its costs. There were many hiatuses in its 82-issue history (20 November 1989-February 1997). Its gradual shift in focus from auteur filmmakers to celebrities also reflected its struggle to adapt and survive. In April 1997, an 83rd issue appeared under a new name. Under new ownership, the magazine no longer only focused on film; it also included topics such as multimedia, visual arts, music, and social issues. This incarnation of the magazine was even more short-lived this time. Within a year, failing to attract new readers and losing old fans, the magazine finally ceased publication for good. Many considered The New Influence the ideal film magazine because of its wide-ranging and extensive coverage on European, Hollywood, and Asian films. Every issue focused on an important film personality and included in-depth reviews of recent theatrically-released films (usually 2-3000 words per review), facts and statistics on film production, feature reports, and film festival news. It even included a small section on television, music and commercial cinema. In other words, it was far more approachable than the previous incarnations of Influence. On the other hand, the sheer amount of writing in the magazine was often too much to digest. It was this very quality, however, and the magazine’s timeless film coverage that made old issues of The New Influence sought-after collector’s items. Currently, the most widely-read film magazine in Taiwan is World Cinema (???? ), a monthly publication that focuses on recently released films and Hollywood celebrity news. First published in September 1966, it is one of Taiwan’s oldest existing publications. For many young cinephiles, the magazine functions as an introduction to cinema, thanks to its coverage of current movies. Only the columns in the magazine enjoy more freedom in scope. Incidentally, World Cinema was also the first film magazine I subscribed to when I was in secondary school. My very first review, on John Woo’s A Better Tomorrow, was published here when I was 16, and I have been writing a column for the magazine since 1990. For a long time, I was writing for both World Cinema and The New Influence, two magazines with completely different styles. In the late 1990s, the team behind The New Influence started LOOK, a magazine that was similar in style to World Cinema. Although it changed ownership a number of times and eventually changed its name to iLOOK, the magazine managed to survive on its own even after The New Influence‘s demise. This reflected the tough market for film magazines in Taiwan. 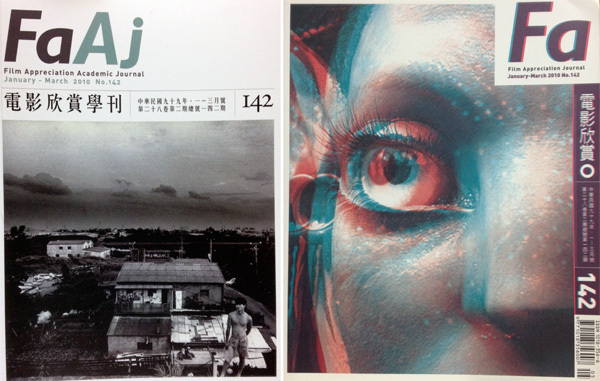 The most academic film magazine in Taiwan is Film Appreciation (????). Being the key publication of the Chinese Taipei Film Archive, it has managed to stay afloat even after the downfall of several other important publications. It is mainly given out free to members of the film archive, scholars and other associated institutions. Film Appreciation quickly became an important publication in its early days, because it featured articles on film history, genres, and theory. It also frequently translated pivotal film essays from all around the world. As a result, some of its archival issues remain well-referenced by film scholars today. In addition, it also featured interviews with international filmmakers when their work was screened in Taiwanese film festivals, providing year-end reviews of their oeuvres. Unfortunately, due to its infrequent publication, the magazine never quite reached out to the film community at large. As article submissions started to fall, the bi-monthly magazine started to publish only once every three months. Regardless of this, Film Appreciation remains the only regular platform for academic film criticism. At a time when monthly film magazines are about to be replaced by online publications, a new magazine, Cue, was launched by a team of young people in April 2010. Unlike other film magazines, it is neither dominated by Hollywood discourse, nor by serious film criticism. Instead, using cinema as its jumping board, it explores different facets of urban lifestyle including culture, food, fashion, travel and style. With so many movies being easily accessible today, Cue strives for a hip and light-hearted tone that, perhaps, best reflects the state of contemporary Taiwanese cinema, which, after the rise and fall of the Taiwanese New Wave, still remains mainstream and popular. Translated from Chinese by Tan Bee Thiam and Daniel Hui. Wen Tien-hsiang is the Executive Director of the Taipei Golden Horse Film Festival and is on the board of the Chinese Taipei Film Archive. He also writes for daily newspapers and magazines, and teaches in the universities.